With the return of the rain the leaves would be thick and green again. But now they were scattered and sparse, singed by the heat of the sun. The small bird fluttered, lifting from the dust near the hut. Its red bill was tiny but visible in the morning air. The carriage rumbled past, yearning to finish its journey at the town west of the plain that Thursday morning, its rear red like the bill of the small bird. And then the train would turn again, that evening, dreaming about the city farther east. “It will return”, their herdsman said. “The bird is lucky this day”. The big stone missed. It hit the earthen wall of the hut. The herdsman walked on. The boy followed him. They went past the alii thorn trees to the millet field. “You chased it”, the boy complained. “The bird will not return”. “I do not. The nyadit will return”. “You will climb my back as you often do”. “Now it is you who said it”, the boy charged. He added, “If you change, I will tell my friend Mbigo. We will laugh at you”. They both pinned their eyes on the small quelea bird flying over scanty branches of thorn trees gathered in the distance, near the dusty road which led to the town farther west. When the bird became too tiny to see they abandoned catching it with their eyes. They looked at the small swept space in front of the hut where the quelea had been eating grain-pregnant millet heads harvested by the boy’s mother yesterday and now put to dry under the eye of the sun this morning again. When his mother began spreading millet on the mat yesterday the quelea arrived behind her back and perched on the thorn tree. The bird was hungry. The way everybody else was at the beginning of the harvest season. Yesterday the quelea stood on the mat and pecked the millet grains. “Look at it”, the boy said yesterday. The boy pointed at the mat with the millet. “It is called ‘nyadit’”, the herdsman explained. “The mouth is red like osaye fruit”. “I know you want the bird”. The boy said, “Eee, I want”. After filling its stomach with millet grains yesterday the bird hopped to the shade under the eaves of the hut thatch and sucked water from the half-broken ear of the old pot which the boy’s mother had dug into the ground for hens to drink from each day. The boy and the herdsman looked on as the quelea drank, turned its red bill upwards, drank again, turned, drank, and turned…the way all birds do. The quelea shook her feathers and preened them. When the boy’s mother came out of the hut yesterday the small bird flew away. “If you want the nyadit bird”, the herdsman reminded the boy as they walked to the millet field this morning, “I will make a catapult tomorrow. I will catch the bird for you”. “You are strong like God if you catch the bird for me”. “Mother says that good dead people go to His big house”. The herdsman looked at him. “They burn with the Devil in the big fire”. They came to the millet field. The herdsman bent his back and the G of his sickle left slaughtered necks of finger-millet stems behind every drawing movement of his arm. The basket received their heads. When the basket was full the herdsman emptied it on the rising heap. The boy’s mother made trips carrying the harvest home to dry in the swept laro yard where the quelea ate yesterday and the herdsman’s stone missed this morning. Towards midday the boy stood near the heap shooing away the red-billed swarm of quelea. The birds wanted to perch and eat. Mbigo, the boy’s classmate, passed on foot wearing a pair of red faded shorts, smiling but, as usual, displaying no appetite to greet them. He was going to collect milk and carry in a cooking fat tin from the homestead of the old neighbour. Mbigo the shy one whose sad face eternally looked down was bare from the waist upwards. “Greet us, wuoyi!” the boy’s mother shouted at the young passer-by from the millet field, subtly challenging the tin-carrying boy to act mature by referring to him as ‘a man’. The passer-by stopped. He looked away from the harvesting trio, smiled as always, and continued knocking the bottom of the tin. “For how long will you be a girl, Mbigo?” the boy’s mother confronted him. The passer-by stopped drumming. His small elbow folded suddenly. His right wrist sealed the valley of his eyes. They saw his back shake. “Do not cry, my child”, she hurried to the footpath, held the bare-chested boy close, and pressed him onto her stomach, pulling his wrist away from his eyes. “Mos, my child – sorry”. Drops of tears had wetted the front of his red, faded shorts. “He is crying! Mbigo is crying –” the boy standing near the heap of harvested millet yelled at his classmate friend from a distance. “Do not laugh at Mbigo”, the herdsman shouted at the boy. “You yourself cannot kill a single quelea nyadit. Your buttocks grind flour when those small birds approach you in a swarm”. “You told him the truth; he himself is nyadit – always eating and chirping” the boy’s mother concurred from the footpath where she stood consoling the one carrying the tin. The milk-collector stopped crying. She wiped his eyes for him. “Is your mother at home?” the woman remorsefully asked. “Greet her for me when you return”, the woman said, dusting his red pair of shorts for him. She let him proceed to the milk place, her guilt spreading inside her breast. She cursed herself for forgetting that the wound of the previous four years was still raw in the milk-collector’s memory. She knew that even his mother had not properly healed. The milk-collector was six years old when the government had turned cruel mother-hen gouging out the eyes of her own chicks like wind and smoke blowing across the village to the east sweeping everybody west (except) capturing the milk-collector’s father and marching him to the mysterious red place no one quite knew. Now the boy was ten, and still growing, but the startling memory of that year as the only explanation to the absence of his father had created a permanent child in him. They were leaving the millet field at the same time the milk-collector was returning home wearing his red pair of shorts the tin of milk safely gripped in his hands. “Do not forget to greet your mother for me”, the boy’s mother reminded Mbigo. That evening the boy accompanied the herdsman to the railway line. Individual stars began peeping from the sky. The boy and the herdsman watched as the single torch shone from the last railway station before the train passed behind their homestead. They did not initially hear its rumbling. And then the train rattled past, its wheels quarrelling with the metallic line. The boy stood by as the long body of the carriage crawled along. He waited for the conundrum: the red tail of the train. He had wondered many times why all trains seemed to crawl, but their red tails often sped by very fast, faster even than most cars. The tail came and flashed past. The boy screamed and shouted in the grey evening. “To the city”, the herdsman told him. “You took long before you answered”, the boy said. “You have not gone to that place. You do not know how the city looks like”. “I am not like you who drinks porridge near the granary every morning”. “The city is far, but our town is here-here”, the herdsman pointed west. They went past the two alii thorn trees, rounded the entrance, and entered the homestead with the fall of darkness. 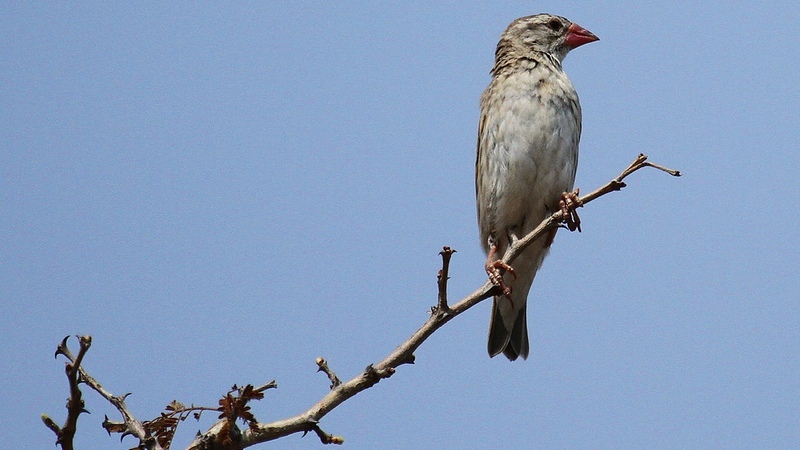 The next midday the red-billed quelea returned. She flew from the thorn branch and perched on the millet mat near the hut. The sun burned. The air trembled. The bird picked the first two grains. She raised her head and looked. The herdsman slipped the taut catapult when the quelea next dipped her head to pick the third grain. The stone did not find her head. It bruised her thigh and left a scattering of feathers crying on the dust. The bird fluttered blindly towards the ojuok euphorbia fence. The herdsman ran after her in his akala tyre shoes. The boy looked on. The sprinter found her trapped amongst the thorns and returned, happy for the boy. The bird was alive when the herdsman gave her to the boy. Her warm blood and heart beating in the simple grip of the boy’s hand made his fingers sweat. He looked again, with admiration, and saw her yellowish feathers, small wings, and the alien red bill. Her dark, rounded eyes did not look at the boy. They focused on something distant. “She is sad”, the boy told the herdsman. “She wants to go home and cook lunch for her many hungry children”. Just then the boy felt a tiny tremor in the grip of his hands. He looked again. She lost her wild and natural colour. Both her eyes were closed. Her head drooped. The feathers on her neck stood. The stone had raptured something inside her stomach. The red bill of the quelea suddenly lost its alien life. The boy feared. Something told him that the momentary trembling was the last great earthquake that shook all breathing creation – including him and his classmate, Mbigo, one silent day behind many hills in the distant future.